A recent motorcycle crash on Route 138 in Easton left one man hospitalized. According to Easton Fire Department Lieutenant Ronald Keeman, Christopher Logan was transported to Boston Medical Center via medical helicopter after he lost control of the motorcycle he was driving near Stonehill College. A hospital spokesperson, Gena DiGravio, said Logan remained hospitalized in serious condition several days after the accident. Following the crash, Officer Charles Hopkins of the Easton Police Department reportedly ticketed Logan for driving a motorcycle that was not registered or insured. The exact cause of the injury accident is still under investigation by local law enforcement officers. The crash reportedly reduced traffic on Route 138 to one lane while the Easton Fire and Police Departments reconstructed the accident. This incident was not the first time Logan was involved in a vehicle collision in Easton. In 2007, Logan was allegedly arrested for operating an automobile to endanger and racing in connection with a three vehicle crash on Washington Street. Traveling on a motorcycle is both economical and efficient. Regrettably, riding a motorcycle can also be extremely dangerous. The injuries sustained in a motorcycle collision are often severe and may be life threatening. Because motorcycles offer less protection to a driver than an automobile, even a low speed accident can be serious. 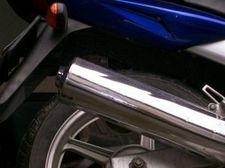 In Massachusetts, motorcycle riders are placed at risk of being hurt or killed anytime another motorist follows too closely, fails to check his or her blind spot prior to changing lanes, engages in distracted driving, or operates a vehicle while impaired. In addition, motorcycle drivers are also frequently injured when another driver simply fails to properly yield the right of way on roadways throughout the state. If you were injured or a family member was killed in a Massachusetts motorcycle or other vehicle accident, you may be entitled to collect damages to cover the costs associated with your injuries. The victim of a motorcycle crash that was caused by another motorist may recover compensation for medical expenses, physical therapy, pain and suffering, any resulting disability, lost wages, and more. Additionally, the close relatives of someone who was killed in a motorcycle collision may be eligible to file a wrongful death claim. Anyone who was hurt in a Massachusetts motorcycle accident may also be eligible to receive Personal Injury Protection (PIP) benefits from an automobile insurance company. If you were hurt in a motorcycle accident, you should contact a quality personal injury lawyer to discuss your options for recovery. If you were harmed in a motorcycle crash that was caused by another motorist, please call the Law Offices of Sousa & Sousa, P.C. at (508) 230-5300 in Brockton or (508) 823-6111 in Taunton. Our knowledgeable Easton motorcycle accident attorneys focus their practice exclusively on personal injury law. The skilled lawyers at Sousa & Sousa have more than 50 years of combined experience helping the victims of unexpected injury accidents throughout Massachusetts. The Law Offices of Sousa & Sousa represents clients who were injured in Taunton, Easton, Brockton, Stoughton, Bridgewater, and other surrounding towns. To speak with a dedicated personal injury attorney today, contact the Law Offices of Sousa & Sousa through the law firm's website.